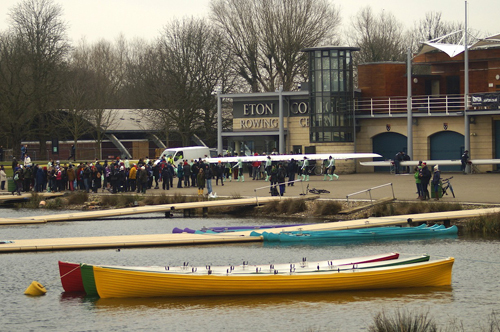 In the final race of the day, the Lightweight Men’s Boat Race, Oxford’s lower cadence proved successful in the difficult water. Both crews got out of the blocks cleanly, with Oxford taking a slight lead by the 250m point. Rating 34 compared to Cambridge’s 39, they extended this to ¾ length by 500m. Cambridge made a push, holding Oxford’s speed and checking their advance for the middle of the race. But a confident Oxford crew maintained control, and with the crowds cheering them on they crossed the line 1 ⅔ lengths ahead. A very cold umpire, Sir Matthew Pinsent, said “The women’s lightweight race was close for the first 500 or so but the Women’s Boat Race had that chance of lead, which was great. Lightweight Men’s Boat Race: Oxford bt Cambridge by 1 ⅔ lengths in 6:49.